Shanghai Spins Casino is one of the few places which such a wide variety of slots games. In fact, the players can click on over 300 games. However, the nature of the games is what makes this casino so attractive. Many of the games are new and unavailable elsewhere. It's fair to say that the casino has been at the forefront of innovation and continues to provide a unique service to the players. The main page looks very appealing and displays some of the most interesting games. The "play now" button invites the player to access each game and play it instantly over the web. The player has a chance to claim a welcome bonus (Shanghai Spins Casino Bonus). In order to do that, it is necessary to register a new account. A deposit can be made using a promo code (The code is SHANGHAI). Once the deposit is accomplished, it is possible to get a 100% bonus up to £25. It must be said that this is not a very generous welcome bonus, at least when compared to what the competition often has in store when it comes to such entry-level promotions. Thankfully, the casino provides an additional 50 free spins, but this is only a slight improvement over the main offer. The website provides easy payment options, so that the players won't have a big burden when making a deposit. Basically, the standard credit cards get a pass. This would include cards such as; Visa and MasterCard. But there is also support for the less traditional services like; Maestro, EntroPay, PayPal, PaySafeCard & Neteller. This allows for a very convenient deposit-making process. Furthermore, the website has attempted to apply the best security measures to protect the data of the players from leaking out into the hands of hackers. The Orient-themed Shanghai Sins Casino hopes to attract players from different parts of the world. However, the website has also made it clear that some players will not be able to participate in the games. The countries that have been excluded would include; United States of America, Israel, Turkey, Spain, France, Italy, Denmark, Belgium, Gibraltar and Antigua. 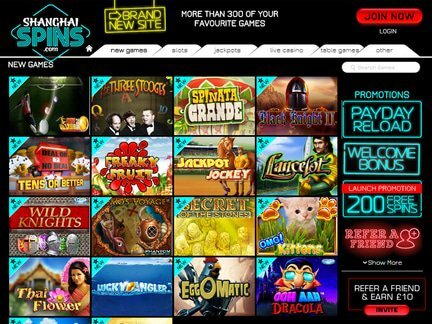 Under the category of "your games", the Shanghai Spins Casino player can verify which games have been getting a decent amount of traffic. For the purpose of full discosure, it is wise to mention a few of them; Starburst, Rainbow Riches, Wu Shi Lion Dance, Millinaire Genie, Cashino, South Park, Live European Roulette & Reel Rush. 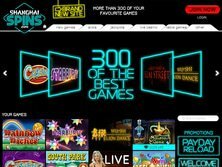 The website also wants to showcase a wide variety of new games. These games are added in order to attract more visitors. Here are some of the latest titles to be showcased; Keno Cup 2010, Monopoly Big Event, The Three Stooges, Spinata Grande, Black Knight 2, Deal or No Deal & Freaky Fruit. There are no traces of such complaints anywhere. The players who have any doubts and questions can always turn to the customer support service for answers. Unfortunately, the ShanghaiSpins Casino makes the player wait for up to 72 hours before an e-mail inquiry is answered. This can be a long waiting time for some. Thankfully, a signed-up member can also use the instant chat window, which provides a much faster connection to the staff. Cassava Enterprises has a Gibraltar-issued license which allows it to offer online casino services. The UK arm is licensed by the UK Gambling Commission. In terms of licenses, the casino has obtained them from reputable sources. The UK license is particularly valuable. The players must make sure that they are allowed to play the available casino games in their own countries. The license will not be helpful if such activities are forbidden by law. I thought that the games were the most exciting out of all the things that I've encountered. The promotions were likewise okay. However, the bonus deals were lacking somewhat. They should definitely be re-evaluated by the staff. Is this really the best that the casino can do at this point? Coming back to the games, I can say that the slots game category is probably one of the better sections for enthusiasts of this type of a game. The great game variety left me quite excited and eager to go back for more!